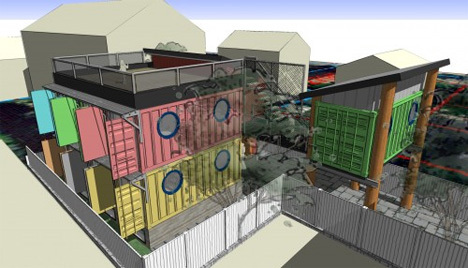 This recycled shipping container home design from Keith Dewey makes playful use of the textures and features inherent in old cargo containers. Floor-to-ceiling windows in each of the six containers that make up the main house can be covered up by the still-operable shipping crate doors. The detached studio is on stilts to allow the family car to pass underneath, and the garden atop the main home provides outdoor space for the otherwise-cramped lot. The two-bedroom home features a small section of wood-frame construction to add a bit of space onto the shipping containers’ area.